Got a big music collection fenced in on your PC or Mac? Let it out to play on the Amazon Cloud Music Player, which lets you enjoy your music collection on any PC or Mac connected to the Internet, or on any Android device. 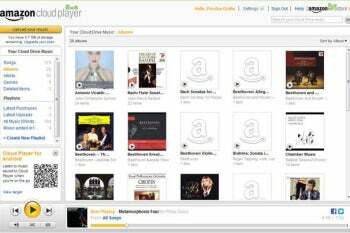 You'll first upload your music files using desktop program Amazon MP3 Uploader for Amazon Cloud Music Player. After that is done, you go to Amazon Cloud Music Player on the Web, and listen to your music there, or if you have an Android device, use the music player app. The Amazon Cloud Music Player lets you play music from any computer via the cloud, or from an Android device. First download the Amazon MP3 Uploader for your PC or Mac. Then tell it to upload your music, and it uploads it all to Amazon's cloud-based storage service. At that point, you can play any of the music via a browser on the PC or Mac. The browser makes the connection to the cloud, and streams and plays the music to your computer. You can also play the music on any Android phone or tablet you have, using a free Android app called Amazon MP3 with Cloud Player. There's no app for iOS devices, though. The Amazon cloud music service is free for up to 5 GB of music files. If you want more than that, you'll have to pay $20 per year, which is certainly no great expense for such a useful service. Depending on the file types in your music collection, you may run into trouble. It works only with mp3 and .m4a files. So if you use Windows Media Audio files (.wma) or another type of music file you're out of luck. If you want to play .wma files, use the Google Cloud Music Player. As with the Amazon cloud music player, you download an app that uploads your file, and visit a Web site to play the music. Note: The download button takes you to the vendor's site, where you can download the most recent version of the software. Upload your music and play it via the cloud.